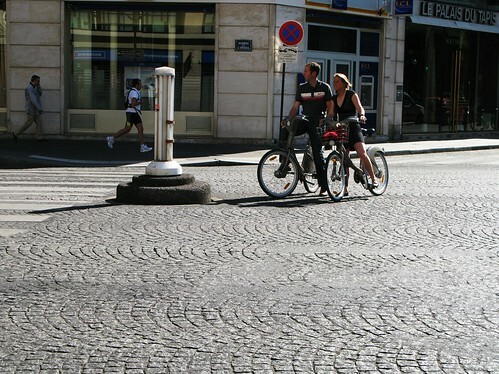 One of the best things we noticed about cycling in Paris was that Parisians have understood how sociable cycling is. Cycling in couples is a common sight in Copenhagen and by all accounts Parisians have embraced this sociability as well. Pere et fils in the bike box at the traffic lights. Casual moment. He was pointing out various buildings to the girl as they rode. A flock of Vélib's on the bridge. Chic couple at an intersection. 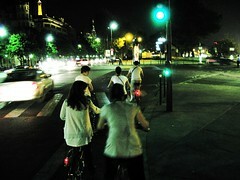 An interesting aspect of this bike life in Paris is that the Vélib is seen on the streets at all hours. The metro closes early, compared to other cities, but the Vélib is always there for you. Nightlife in Paris is made so much easier. Wow, this looks fantastic! 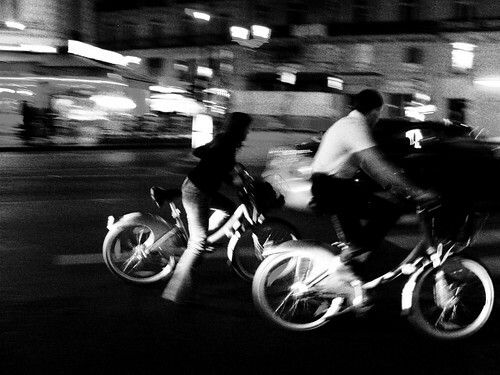 I spoke with a group of students from Paris recently and they said that Velib is a great new option for getting around at night after the Metro stops running. Since taxis are too expensive on student budgets, in the past they had to either walk or wait for the night bus, which gets very crowded and doesn't run often. Now they can get home from a night out quickly and cheaply. I love this website! I don't bike much (everywhere I go is walkable) but your pictures are very inspiring. I have a question. 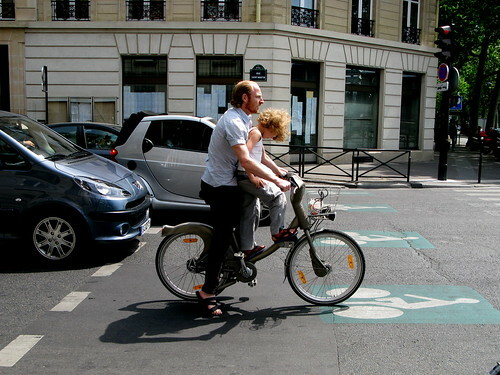 I notice that Copenhagen and Parisian cyclists don't bother with helmets. I hate helmets and they're one of the reasons that cycling is so tedious here in Canada. The other thing that I hate is locking and unlocking my bike, and carrying around a heavy lock and cable. Do you Europeans lock up your bikes, and if so what do you use? Indeed, Anne. It's a whole new nightlife culture. 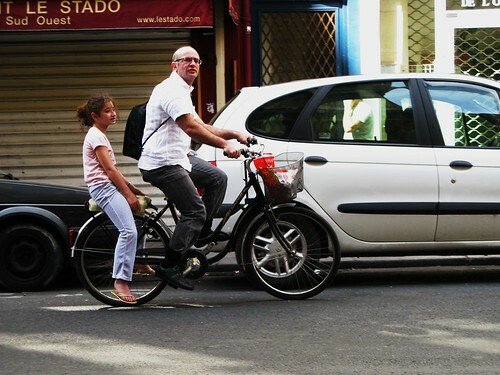 Amy: The European Cyclist's Federation and the majority of member states do not advocate helmet usage simply because there is no conclusive proof that helmets do what their manufacturers claim they can do. 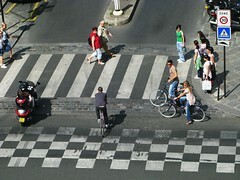 I've read an enormous amount of research papers on the subject and nothing convinces me that helmets will save my life. This is from a scientific perspective. An interesting resource is the Bicycle Helmet Research Foundation. It's a group of scientists and doctors who are not anti-helmet, but rather anti-manipulation of statistics. Read more here. Bike helmet advocacy and especially legislation effectively kills off any hope of obtaining bike culture. Regarding locks, we have a post on our sister blog copenhagenize.com about the Danish system of wheel locks here. Speaking on behalf of Amsterdam cyclists I can tell you that we lock our bikes like there is no tomorrow :). Most here have locks that are worth more than the bike itself. Both aspects have come about historically from the high rate of bike thefts. good to hear from you, mindcaster. hey, we get bikes stolen here, too. 17,000 a year in Copenhagen. But most people only use wheellocks. i hate wire locks. i want ease of use. key in, turn, click, ride away. when locking it's just flip up wheellock, click, walk away. Love your Paris series, I'm eager to visit my friends there soon now! 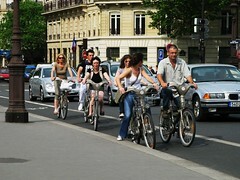 I just won't tell them it's because of Velib ;). Yeah, 70.000 here, it's crazy. But, as you know, it's a calculated risk here, so 69.999 of them aren't worth more than 10 Euros anyway :). I feel more heartache for those 17.000 presumably lovely, immaculate Danish bikes! Oh! And thanks so much for the link back! Do you mean cycling give you opportunities to know people and to fall in love?? Good reasons! I wish Don and I would have gone to Paris when the Velib was up and running, that would have totally changed the dynamic on our trip! And yes, metro does close early. And in my experience, dealing with Paris cabs + cabbies is way more contentious than in NYC! 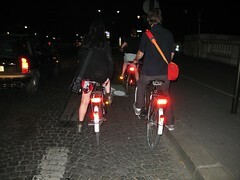 Go Velib! Also, love your blog. Without being cheesy, it has been so inspirational.